Four years ago we stood on the narrow steps to the Bnei Brak apartment of Rabbi and Rebbetzin Kanievsky. My son and I were here with his nursery school class. Rabbi Kanievsky was going to give a blessing to this group of four-year-old boys who were all dressed in their Shabbos pants and shiny shoes. That morning my son had woken before dawn and come racing into our bedroom. "Ima, I want to get dressed. Is it almost time to go? The Rav is waiting for us!" When we walked into the Kanievsky home, the first thing I noticed was how small the apartment was. How will we all fit? We went into the tiny room lined with hundreds of books that go from the floor to the ceiling. The boys clutched their mother's hands as the Rebbetzin walked in. It felt like the room expanded somehow. It didn't even feel crowded. "What beautiful kinderlach!" the Rebbetzin exclaimed as if she has never seen children before. "Come, I want to tell you a secret, kinderlach." The boys let go of our hands and slowly moved towards her like branches of a tree reaching for the sunlight. "I have a little package for each of you. But do you know what is sweeter than candy?" The boys' faces were lifted up towards her with smiles filling their eyes. It was so completely quiet. "The Torah. It is sweeter than any candy in the whole world." She whispered words of blessing as she handed out little bags with candy to each of the boys. Then the Rav's assistant came to bring the boys into the Rav for a blessing. But my son clung to my skirt, refusing to move. "You've been waiting for so long for a blessing from the Rav," I whispered. "I'm waiting right here. Don't be afraid." I tried to bring him towards the rapidly disappearing line of his friends. But he wouldn't go. "No, Ima. I want to stay with you." I didn't know what to do. We came all this way. He was speaking about this trip for months. My mind started to fill with self-doubt. I thought about a client that I was struggling with who was in a terrible relationship and seemed less reachable every week. I thought about the button that fell off one of my daughter's shirts that week and when I told her that I would take it to the tailor, she looked up at me in surprise saying, "Ima, you don't know how to sew?" I thought about all of my children. I have no idea how to raise these children, how to run my house, how to speak to my clients. I don't know how to be a mother. Why is my son the only one who is afraid? There must be something wrong with me. Suddenly Rebbetzin Kanievsky was beside me. Her hand was on my shoulder as she peered down at my little boy. "You don't want to leave your Ima? You're a smart boy. I want to give you a blessing. You should grow to be a scholar and a leader among the Jewish people. Here motek, this is for you." The Rebbeztin handed my son a honey cookie and then looked me in the eye. Her own eyes were full of light, like a million stars were shining from within. "A mother's love is like honey. That is why your son wants to stay with you. Because of that sweetness that you give him. Don't be afraid to keep giving that to your children. Just like God's sweetness. Just like He holds us in His arms." My eyes filled with tears. I lifted up my son. I don't know why I deserve such a beautiful gift, but God chose me to be your mother. Forever. When we heard that the Rebbetzin passed away during Sukkot, I was sitting in the sukkah with my children. Tears rose in my throat as my daughters gasped in shock around me. The Rebbetzin? She passed away? When? Why? How? I thought of the hugeness of her heart. How her eyes lit up when she saw all those little boys in her home. How the sweetness of all of her blessings lingered still. I looked up at the glittering decorations hanging above us and the stars peeking out from between the branches. I heard her words echo towards me: A mother's love is like honey. Just like God's sweetness. Just like He holds us in His arms right here in the embrace of the sheltering sukkah. Three years ago, my friends and I went to visit the Rebbetzin. It was a very special and memorable visit. The Rebbetzin greeted us all with her trademark smile, as seen in this picture, and gave us each an individual Bracha. It was one visit that I shall never forget. When I was asked to write about meeting Rebbetzin Batsheva Kanievsky, I was honored to do so. The profound effect that she had on me, both as a Jewish woman and as a medical professional, can only be expressed as mystical, beyond inspirational. There isn't a day that goes by that I don't think about her and the impact that her captivatingly warm personality has had on my own spiritual and personal growth. I hope my story will inspire other Jewish women, at every level of observance, to become more aware and more sensitive to those who are in need of encouragement and assistance. That is the Rebbetzin's ultimate legacy. In 2004, as part of the Jewish Renaissance Foundation, I accompanied a group of forty New Jersey doctors on an intense, nine-day trip to Israel. As a nurse, I was proud to be associated with this remarkable medical team, which was to receive bio-hazard preparedness and emergency response training in case of a biological or chemical terrorist attack in Israel. The planning for this training had been in the works for three years, since the 9/11 attacks and the war in Iraq. When we arrived in Israel, some team members opted to meet with colleagues at the Sackler School of Medicine. Training would begin at 6:00 a.m. the next morning, so I decided to remain in the hotel. Suddenly, almost like a seed had been planted in my head, I thought of my friend Avigail Ikin, whom I hadn't seen or heard from in over ten years. I had traveled back and forth to Israel many times over the years to visit family and friends, and I could have met up with any of them that day, but somehow Avigail's face appeared in my mind. We had become friends when her husband was one of my patients in Boston, where I served as the health coordinator for ROFEH International, under the auspices of the Bostoner Rebbe, Grand Rabbi Levi Yitzchak Horowitz zt'l. Avigail lived in Ramat Gan, only fifteen minutes away from my hotel. She was so overjoyed to hear from me, she insisted that I join her to visit Rebbetzin Batsheva Kanievsky. Truthfully, I had no idea who Rebbetzin Kanievsky was or why I needed to see her, but as long as I could be home at a reasonable hour to get up for the early morning training, I agreed. Avigail and I drove to the very religious community of Bnei Brak. As one of the top practitioners of the Alexander Technique, a process of aligning the skeleton and muscles to overcome tension and pain, Avigail visited the Rebbetzin every week and helped her stay healthy while on her feet all day. She encouraged me to ask the Rebbetzin for blessings for my children and family. I thought to myself, Sure. Who could'nt use a few extra blessings in one's life? When the door opened, I sensed an energy force that I will never, ever forget, and I knew that I was standing in the presence of a very special and holy woman. Since my Hebrew wasn't fluent, Avigail introduced me as a nurse and told Rebbetzin Kanievsky why I was in Israel. It had been only seconds, but I felt as if the woman with the kind eyes and warm smile who was hugging me had known me for a lifetime. 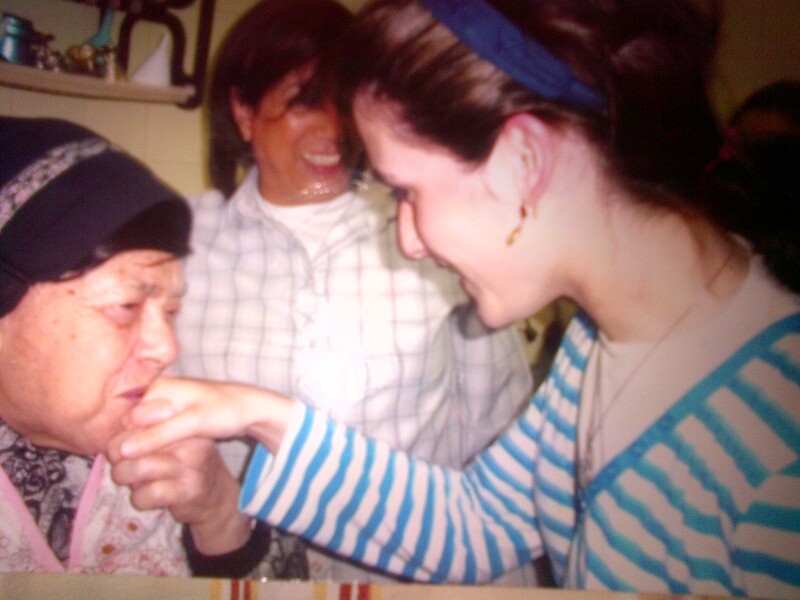 This was my bubbe, and I was being welcomed home after a long journey. The Rebbetzin gave me a tour of her very humble apartment, decorated simply with a few pieces of furniture but filled to the ceiling with the books of her husband, Rabbi Chaim Kanievsky. The kitchen was so tiny. I was almost embarrassed by my Five Towns loftiness, thinking how could such a small kitchen support a Shabbos dinner? Maybe the Rebbetzin was able to read my mind as she took me into the living room and asked me sit on the Steipler Gaon's chair. Her father-in-law, Rabbi Yaakov Yisrael Kanievsky, a great tzaddik and scholar, was known throughout the world as the Steipler Gaon. She told me to sit in that honored place and pray, which I did. It wasn't that I obeyed her I actually wanted to pray. Being with Rebbetzin Kanievsky motivated me to pray and look into myself.Then she said that it was Lag Ba-Omer, a holiday commemorating the passing of Rabbi Shimon Bar Yochai. She told Avigail to take me to Meron, near Safed, to visit his grave. Politely, I tried to refuse and explained about my early morning training, but she simply said I would be fine and gave me more berachos. Avigail and I took a three-hour bus journey to Meron, leaving her car in Bnei Brak. I was thinking about my jet lag and about the lack of energy I might feel for training the next day, but what happened that night altered me forever. Had I never met the Rebbetzin and followed her advice to visit Meron, I would have missed out on a most insightful experience, which has buoyed my mission in life. Meron, a tiny, quiet town situated in the mountains of northern Israel, is transformed on Lag Ba-Omer into a sea of a million people who come to receive blessings at the grave of Shimon bar Yochai. Meron was a whirl of bonfires, singing, dancing, barbecues, and food from every corner. I stared in amazement at the crowds of people, religious, secular, teeming with activity. Yet, at exactly midnight, Avigail and I were able to walk unimpeded through the throng of berachah (blessing) seekers, directly up to the tomb, touch it, and pray, as if the hand of the Rebbetzin herself was guiding us. Totally bewildered, Avigail and I headed back to my hotel wondering how we had managed to accomplish that feat. The next morning, I went to breakfast at 5:15 a.m. Although it was early and I anxiously awaited my first cup of coffee, I was confident that I had been energized by the previous night's activity. I had changed and was more determined than ever to make this mission a meaningful one. I returned to visit the Rebbetzin with Avigail several times, on subsequent trips to Israel. Each time was as exhilarating as the first. I took notice of the women from all backgrounds and of all ages who sought her berachos. Additionally, there were women with deformities, women with physical ailments, stress, and sadness who sought her holy guidance. They came to her with broken hearts and spirits, and she addressed each one as though no one else existed in that moment. She cared so deeply. Her heart was so big. One time, knowing that I was a nurse, the Rebbetzin asked me to help her with a woman who had come to her with a medical complication. I was able to offer some medical advice about her serious case of lymphedema, fluid retention. I watched the Rebbetzin connect to the woman in a very deep and powerful way emotionally. Because my training encompassed a holistic approach to healing, a combination of body, mind, and spirit, I felt a kinship with the Rebbetzin and her sincere love of humanity. Her actions validated my core belief that hope, love, caring, and faith contribute to overall strength and health. It changed me forever and I am a better nurse today because of Rebbetzin Kanievsky. On another occasion, in 2008, the night before my niece Chana's wedding in Israel to Yaakov Mecholovitch, a grandson of Rabbi Shlomo Freifeld zt'l of Shor Yoshuv in Lawrence, New York, I went with my mother, sister Sharon, and Chana to see the Rebbetzin and ask for a special blessing. The Rebbetzin spoke to my mother in Yiddish and was so moved by the simchah, it was as if her own granddaughter was getting married. Watching my niece receive a premarital blessing with three generations of my family united felt like a gift from G-d. The Rebbetzin gave me several holy books to read and told me to recite specific passages from the siddur and tehillim (psalms) about being strong and hopeful. I continue to say them to this day. Those passages spoke to me in a way I am unable to adequately express, but it was as if the Rebbetzin knew exactly what battles I was fighting. Just like the personal visits with her, these passages and tehillim reenergized and revitalized me, and, as if from the mikvah, I emerged clean and pure. Rebbetzin Kanievsky generated love and understanding. I knew from the very first time we met that she cared about me, loved me, and wanted the best for me. Even in a room of a hundred people, she had the uncanny ability to make you feel like you were the only one there. She made me want to be better, to serve others, to be a vessel for caring. Use your nursing skills to help people, especially the Jewish community, was her sage advice. October 15, 2014, will mark three years since this earthly world lost the Rebbetzin. However, she is with me as strongly today as when I first met her in 2004. Her legacy is one of hope, compassion, and genuine lovefor women and for all of humanity. Ten years after I first met Rebbetzin Kanievsky, Deborah Gallant, a business coach I met through the Jewish Woman Entrepreneur Conference referred me to Rabbi Ernest Rothman. Rabbi Rothman asked me to help launch Ner Echad, which would raise money for the widows and orphans in Israel that Rebbetzin Kanievsky helped support. Being involved with Ner Echad is an opportunity to spread the word about the Rebbetzin's goodness and keep her spirit alive. Ner Echad is a continuation of the Rebbetzin's lifework and will be guided by her husband, Rabbi Chaim Kanievsky, and her beloved daughter, Rebbetzin Leah Kolodetsky. I often wonder if the Rebbetzin herself envisioned this when we first met in 2004. At that time, she encouraged me to use my nursing skills to strengthen the Jewish community and told me that one day I was going to do something very important for Klal Yisrael (the Jewish people). With her encouragement and the Jewish Woman Entrepreneur network, I've started my own consulting business to aid Jewish causes and philanthropic organizations in Israel, the United States, and around the world. During one visit to Rebbetzin Kanievsky, I had my picture taken with her. The framed photo stands on my desk. Every day I remember this special and marvelous person who has influenced my life so profoundly. Her blessings guided me and still surround me like her energetic hugs. I was born and raised in Memphis, TN. My parents raised me and my 4 siblings in a home surrounded with Torah and mitzvos. We were sent to summer camps that enhanced what we learned at home. We each spent a year after high school learning in Israel. In 2001, I returned back to Tennessee and then decided to move to New York for college. In 2004, I was very fortunate to spend a month on a summer program called Binah Yesaireh in Bayit Vegan. On August 5, two friends and I took the trip to visit the Kanievsky family hoping to receive brachos. When we arrived, the house was packed with people waiting inside and outside for their turn. I'm not sure why, but we were waved to come inside and daven and sit in what I think was the Steiplers chair until the Rebbetzin had a moment for us. After some time, we were able to meet and speak briefly with the Rebbetzin. We took this picture(below) with her. I am on the left, then my friend and then Rebbetzin Kanievsky Z'L and another friend. Right before the picture was taken, the Rebbetzin reached a little further so she could put her arm around me too. Just that small gesture to make sure I was included even though I wasn't directly next to her, gave me an indescribable feeling. What might seem simple and small to others, made an incredibly big impact on me. She made me feel welcome and included. With so many people around her, I felt so close to her and as if I was the only one in the room. Over the years, I have read books about the Rebbetzin and I am still an awe of the incredible life she led. Since then, I got married and B'H we have two children, a five year old boy, Yitzchak Eliezer (Eli) and a one year old girl Ahava Batsheva. My husband Ari and I decided to name our little girl Batsheva after Rebbetzin Kanievsky Z'L. Ahava is for the Ahavas Yisroel the Rebbetzin generated. I am thankful that I had the chance to meet such an incredible Bas Yisroel. I hope we all see the coming of Mashiach very soon. Thank you again for the opportunity to share these photos and memories that I hold so close to my heart. This happened about seven and a half years ago. B"H We had three children within a period of three and a half years of our marriage and then I had secondary infertility. When our youngest was 4.5 yrs old we went on Chol Hamoed Pesach to ask Rebbetzin Kanievsky for a bracha for another child. At first she told us to check our mezuzos, then I told her that we had just moved into our apartment and the mezuzos were just checked. The Rebbetzin said she had a story to tell me. "That she and Rav Chaim had 5 children and then she didn't have another for 3 + years. So R' Chaim felt they should check the mezuzos of the house and it came out that the mezuza of their bedroom was upside down. They turned it right side up and they had 3 more children." Then she told me to accept upon myself a few things. After we spoke for a few minutes I asked her if I could give her my name and my husband's name for a bracha and she just walked away not taking our names... after she finished talking to the next woman, I went back to her to ask if I could get a bracha, she said sure, took our names and said to me "IY"H you will come back to me in a year with a baby" Anyway after I left her room I went to tell my husband what she had said. My husband said the same thing I did, "We just moved I don't need to check the mezuzos as we just moved into our apartment." A couple of days later my husband came over to me and said, "after you told me the story with the Rebbetzin I felt I should check the mezuzos... and the mezuzah of our bedroom was upside down!!" We turned it right side up and I B"H became pregnant shortly after. In my 35th week of pregnant, I wasn't feeling well and started having contractions, which wasn't good because I had had 3 prior C-section and having contractions was dangerous. So my doctor decided to do an emergency cesarean right then. B"H we had a little baby boy, but at the end of the cesarean, all of a sudden I felt like I could not breath. I started screaming to the Dr. that I couldn't breath, but he thought I was only hyperventilating, but after they put on an oxygen mask and it made the breathing harder even, they saw it was not hyperventilation. I felt like I was dying... and the whole time going through my head was "but Rebbetzin Kanievsky said I was going to come back to her with a baby... not just have a baby" and that is the last thing that I remember. I lost consciousness, and had to be put on a respirator. For 3.5 hours I was fighting for my life. I B"H regained consciousness to the dancing and singing of the nurses and doctors. I had what they called AFE - amniotic fluid embolism which has a 90% fatality rate. I survived B"H without any repercussions and went back to the Rebbetzin exactly a year after she gave me that brachah with a beautiful baby boy!! Ner Echad is a qualified 501(c)(3). Donations to Ner Echad are tax deductible.